Tonight is Opening Night of Friday Night Lights, and we have a very special evening planned. The festivities start at 5 p.m. at Highlands North with a Farm Division matchup between the Angels and A’s. At 7 p.m. Majors takes the field in a rookie Manager duel between the Cubs (Matt Goodwin) and Reds (Dino Perazzo). But those games are just the undercard in what is the real main event tonight. 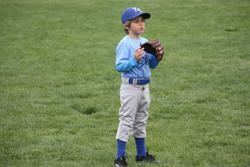 San Carlos Little League is paying tribute to Wren Pitstick. Wren is a member of the Farm A’s and will be throwing out the first pitch in both games. We have lined up two very special catchers for Wren. For the Farm game, Wren will be throwing out the first pitch to his 1st grade teacher at Brittan Acres Lisa Berriatua. And then for the Majors game, he will be throwing to Dr. Leslie Ostrander, who is his pediatrician. Last spring during baseball season, Wren was diagnosed with Leukemia. Although this kept him off the field for the final few games, Wren still came in uniform to cheer on his teammates. Because he was such an inspiration to his team, Wren was chosen for the Farm All Star Game by his coaches. “Baseball has been a huge part of Wren’s life” said his Farm A’s coach Kevin Currie. “Prior to his illness, he could be found most weekends at Burton Park with his Dad, his coaches, and friends, playing baseball. The only question now is can they handle Wren’s fastball? Ms. Berriatua has been tutoring Wren at his house so he can stay up to speed in school while fighting his illness. “Wren is such a strong, happy, and kind boy with a fun competitive spirit. And his sense of humor makes him a joy to be around.”, noted Ms. B. “I’ve enjoyed working with Wren and sharing fun memories – he and I having paper airplane races in the hospital hallway or working hard at double digit addition in the afternoons”. We spoke with Dr. Leslie Ostrander, who will be the honorary catcher for Wren’s first pitch before the Majors game. Dr. Ostrander summed it up best…instead of paraphrasing we will just include her entire statement in full. “To me it is befitting that this Friday Night Lights baseball game is being dedicated to Wren. I remember when he was so sick prior to being diagnosed. His main concern was when he'd get to return to playing baseball with his little league team. It brings me great joy to see that now, 10 months later, he is back on the field. Wren is one of the strongest most tenacious kids I know. I know he is going to beat this, but the manner in which he is doing it is simply amazing. His little body has gone through so much, yet he is always smiling! We can learn a lot through his irresistible spirit. He's made me pause to appreciate family, friends, and this community. He's taught me to not sweat the small stuff. Finally, his resilience reminds me why I wanted to go into Pediatrics in the first place, and that makes me a better physician. It was an extremely difficult year for the Pitstick family, parents Matt and Shana and sisters Claire and Leigh. Wren underwent treatment at UCSF Benioff Children’s Hospital. With the support of his family and the care of his doctors and nurses, Wren’s cancer is in remission. Wren Pitstick is what Little League Baseball is all about. The way he has battled his illness with a positive outlook and a sense of humor is something we can all learn from. Please come out tonight and support this courageous kid as SCLL honors Wren Pitstick!